1. Introduction – It’s piano, isn’t it? Let’s talk about this piano issue. This version is quite different from the album verion (very electronic oriented) and is played on the piano by thom Yorke himself. We will have to adapt our playing to the way the chords are played on the piano. To do this properly we will discuss a few notions such as chords shapes or structural questions. This tab is based on my cover available on youtube. It’s strictly personnal, not official. Of course you can share it, but please quote the blog address or the url of my youtube channel to motivate me! The next parts will give you some helps to play this cover. I think we can call this structure a chaotic structure! It’s a little bit excessive I know but you will quickly understand why I say that. Thom Yorke himself explains he has trouble playing this song twice the same way on the piano. If you listen to the song carefully, you might hear the bass player trying to follow Thom, but he quickly gives up because he can’t figure out what’s coming next. We are not talking of a real improvisation (each arpeggio is nearly always played the same way) but the structure isn’t really clearly defined. Most of the time, Thom Yorke goes from one chord to another without any logic (especially when there is no singing). To cover this song, it was pretty hard for me to memorise each of these changes, I therefore cheated writing on a sheet of paper the chords in the right order (and yet I made a mistake in the middle of the song anyway!). But, what is really pleasant in this song, is that you can easily play it changing the chords leaving the song live its own life according to your inspiration. 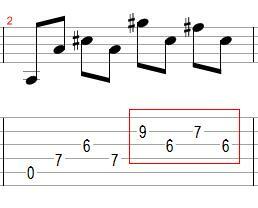 However, you can notice there is a small repetition at the end of the tab when the singing part leads the chord changes. I used repeat bars to make it easier to read befor the outro. The chords used in this song are pretty simple but there are a few subtleties you’ll have to be aware of. 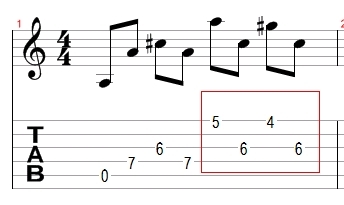 There are two main difficulties : the adds on the high E string (on the E chord for example, you’ll have to add a Ab on the fourth fret), and the length of the song. You’ll quickly notice that, even if you’ve been playing for a long time, this song make your left hand sore. However, it will be difficult to play these chords with your index finger covering the strings. If you take a look at the first two measures for example, we can notice we are playing a A chord. But the melody played on the high E string leads us to the fourth fret, preventing us from playing a barre chord. I have to play the open A string to hear the bass (x07655), my index finger going down to the 4th fret at the end of the first measure (x07654). The same way, in the second measure, we are still in A but the melody leads us to change our chord shape. We will therefore use a A7 shape (x0769x), then a A6 shape (x0767x). The other chords will keep there standard barre shape but we’ll have to stretch a little bit to reach the Ab on the high E string (as you can see in this example). For this song, once the chords shapes and the structure are fully understood, the main difficulty will lie in the muscular endurance. Your left hand will probably hurt you very quickly. In this case STOP WORKING ON THE SONG! You will have to warm-up and to stretch regularly if you want to avoid pain. If you have any question, feel free to contact me through comments and I will adapt the article according to your needs. I also remind you that the tab is made according to my personnal arrangement, please quote the blog address if you want to share it! Fantastic job, but if you could share the tab with a program that allowed us to print it without paying $9 that’d be nice. outstanding and well done foy your hard work in figuring this out and then taking the time to write about it. I’d suggest making a full tutorial youtube video too- you’re clearly talented enough and I’m sure you’ll reach a wider audience!